Q: It is reported that when jointly meeting the press with his Hungarian counterpart Peter Szijjarto, US Secretary of State Mike Pompeo said that if Hungary uses equipment from Huawei, it will make US-Hungary cooperation difficult. The Hungarian Foreign Minister responded that any cooperation between Hungary and China will not endanger his country's partnership with the US, and hypocrisy should finally be left behind when it comes to China. Besides, we also noted that the US Ambassador to the EU said that any country allowing equipment from Chinese makers to be used will face the risk of US countermeasures. What is your comment? A: We have noted relevant reports. Foreign Minister Peter Szijjarto made an independent, unbiased and objective response based on facts and we appreciate that. I want to say that friendship and cooperation have always been the main theme of China-Hungary relations. We do not seek to target nor influence other countries when strengthening our bilateral friendly cooperation. Meanwhile, we hope and believe that the development of China-Hungary relations will not be sabotaged or disturbed by others. As for the statements made by the US side, we have noticed all of them. For some time, the US has been leaving no stones unturned in framing China with all kinds of trumped-up charges and fabricating "China threat" theories. It has blatantly threatened and tried to drive a wedge between China and other countries, tarnished the image of Chinese companies, and suppressed their rights and interests for legitimate development and cooperation. What the US has done is unjust, immoral and nothing like how a major country is supposed to act. We believe that the vast majority of countries will not fail to make out the true intentions and the bullying nature of the US side. We hope that all countries could discard their ideological prejudice and zero-sum game mindset and work to create a fair, unbiased, open, inclusive, transparent and rules-based environment for normal friendly and mutually beneficial cooperation between countries. Q: Reports say that according to the Russian Foreign Ministry's statement on February 11th, Russian Deputy Foreign Minister Igor Morgulov and Chinese Vice Foreign Minister Kong Xuanyou co-chaired the China-Russia consultation on security situation in Northeast Asia. The two sides discussed recent development on the Korean Peninsula and coordinated their joint efforts to ensure the stability and security on the Peninsula and in Northeast Asia. Can you confirm this and give us more information? A: Indeed, Chinese Vice Foreign Minister Kong Xuanyou and Russian Deputy Foreign Minister Igor Morgulov held consultation on the Korean Peninsula issue. We have issued a press release. The two sides agreed that there is a continued momentum of dialogue and deescalation on the Peninsula, and made positive comments on the DPRK and the US efforts to resolve the issue through dialogue. We hope the DPRK and the US can move in the same direction, respond to each other's concerns, and push for the success of the second summit where positive outcomes can be achieved. China and Russia support the improvement of the DPRK-ROK relations and the progress towards cooperation and reconciliation, and will continue to work together for the political resolution of this issue. Q: According to some reports, the US Defense Intelligence Agency (DIA) said in its report on February 11 that China and Russia view outer space as an important part of modern war and counter-space capabilities as a means to reduce US and allied military effectiveness. What is your comment? A: China has noted relevant news reports. First of all, I want to make it clear that outer space belongs to all mankind. It is not exclusively owned by any one country and especially not the private property of the US. The DIA report made unwarranted and utterly baseless comments on the space policies of relevant countries including China. China upholds the peaceful use of outer space and opposes weaponizing outer space or an arms race there. For many years, China, Russia and other countries have been working hard and trying to reach an international legal instrument to fundamentally prevent the weaponization of or an arms race in outer space. There have been some negative moves relating to the security of outer space in recent days. What merits particular alert and attention is that the US has described outer space as the "new war-fighting domain" and announced to establish a "space force" to regularly conduct outer space exercises, which makes it more likely to turn into reality the risks of weaponizing outer space and making it a battlefield. Despite all these, the US has been playing up the so-called "outer space security threats" posed by others. In fact, it is using self-deceiving tricks to justify its own military building in outer space and R&D in advanced weapons. If the US side truly cares about the security of outer space, it should work with China and actively participate in the arms control process of outer space. It should make its due contributions to maintaining outer space security, instead of doing the opposite. Q: According to recent reports, some hackers working on behalf of Chinese intelligence breached the network of a Norwegian software firm as part of China's global hacking campaign "Cloudhopper" to steal intellectual property rights and corporate secrets. Some other reports say Australia is investigating the hacking of the national parliament's computer network to see whether it is related to China. The Norwegian Intelligence Office also released a report suggesting that Russia and China might conduct complex offensive operations on the Internet against Norway. What is China's comment? A: These reports are merely part of a larger smear campaign against China by certain countries. China has always maintained that cybersecurity should be upheld by all members of the international community as it is a global issue that concerns the common interests of all countries. I am sure that those who have long been following cybersecurity issues have not forgotten the PRISM program. They must have also heard of the Equation Group and the WannaCry ransomware, the result of a particular country's attempt to develop offensive cyber tools, that wreaked havoc globally. All those incidents have sounded the alarm for global cybersecurity. Given the virtual nature of cyberspace and the fact that there are all kinds of online actors who are difficult to trace, I must underscore the importance to have enough evidence when investigating and identifying cyber-related incidents. Groundless speculations and random accusations should not be allowed. I'd like to reiterate that China firmly upholds cybersecurity and opposes and fights all forms of cyber attack and cyber theft. 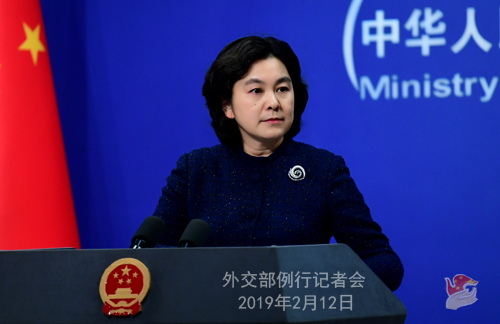 China calls on the international community to deal with cybersecurity threats through dialogue and cooperation on the basis of mutual respect, equality and mutual benefit. Irresponsible accusations, pressure and sanctions will only escalate tensions and confrontation in cyberspace and poison the atmosphere for cooperation. 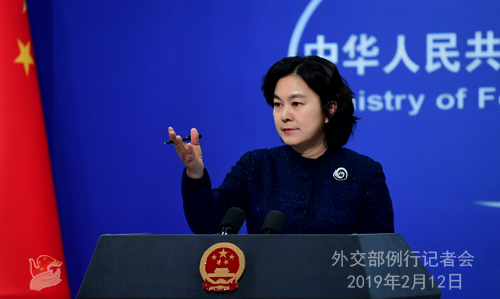 We urge relevant countries to refrain from smearing China by hyping up so-called "cyber theft" and hacker attacks and stop making remarks and moves that undermine China's interests and their relations with China. Q: According to Hindustan Times, in a recent study of the Indian Ministry of External Affairs, the Diamer-Bhasha dam project was cited to have been withdrawn by Pakistan, the West Seti hydropower project canceled by Nepal and China Harbor Engineering Company blacklisted by Bangladesh for bribing one of its officials. The ministry suggested that unacceptable conditions of the Belt and Road Initiative imposed by China are leading to a severe push back. A senior official familiar with the matter expected that there will be a major tweaking of policy in the BRI meeting this year. Can you confirm that? A: I have taken note of relevant reports. Conditions of the projects cited in the report of the Indian side are far from the fact. For instance, the Diamer-Bhasha dam project was not included into the the China-Pakistan Economic Corridor project list. The West Seti hydropower project in Nepal is a commercial project and the enterprises concerned are having consultations over specific details such as the economic feasibility of the project. As to the allegation that China Harbor Engineering Company was blacklisted by Bangladesh, I have learned that it could not be further from the fact. I hope the Indian side will receive our information and be informed that the three projects were cited with false information. More than 150 countries and international organizations have signed Belt and Road cooperation documents with China. A large number of cooperation projects have taken root and flourished, yielding rich fruits and injecting strong impetus into the economic and social development of participating countries. The Belt and Road has become a popular public good for the world and platform for international cooperation. Consultation and cooperation for shared benefits is the golden principle for Belt and Road cooperation. In pursuing cooperation under the Belt and Road Initiative, China has always been committed to equality, openness, transparency, market laws and international rules. We never impose on others or attach any unacceptable conditions. Each and every project is the result of equal-footed consultations. A particular project or two might encounter difficulties or problems, but that does not change the fact that Belt and Road cooperation has contributed to participating countries' economic and social development and has won wide support. China will host the second Belt and Road Forum for International Cooperation this year. We look forward to meeting with all participants to take stock of our progress and map out the blueprint for high-quality, high-level and high-standard Belt and Road cooperation in the future. Q: There are some claims citing China will sell its aircraft carrier to Pakistan. What's your comment on this? A: I have not seen the report you mentioned and have heard nothing of this nature. The Chinese government has always strictly observed the three principles for arms exports. Q: Do you have any updates on the progress of the trade talks between China and the US which began yesterday? A: I would suggest you place your inquiries with the Ministry of Commerce.